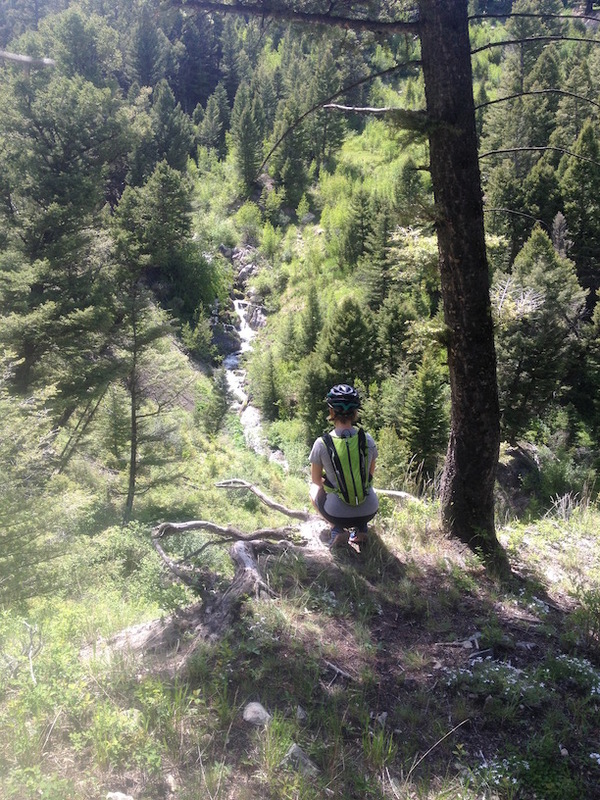 We left Yellowstone NP after a day of mountain biking that afforded us 3 beautiful waterfalls, endless green scenery and 5 miles of steady hill climbing circumnavigating Bunsen Peak (named after the Bunsen who invented the bunsen burner). Decidedly against the vibe of weekend tourists and without the gear to really get into the backcountry we looked to our Road Atlas as we pondered our drive east. The Atlas suggested the northeast corner of the park exited onto a “scenic” drive towards Cody, WY. We laughed thinking it couldn’t get much more scenic than Yellowstone but decided to follow this advice and started towards the northeast exit. At this point we had only seen herds of elk and pronghorn, a family of black bears, some traffic-blocking bison, colorful birds, and soaring hawks. As we approached the end of the park we rounded a corner to an unbelievable view: a huge rainbow, a wide winding river and hundreds of bison and their frolicking young scattered on the grassy plain. This view continued for miles until we became distracted by some stopped cars and found 3 wolves by the side of the road. We too stopped and watched the wolves amble up to a resting bison. One wolf went so close he must have felt the bison’s breath on his face. Just in case this wasn’t a casual check-in, the small herd of bison, in unison, all turned around and silently stared at the wolves. Taking the hint, the wolves turned around, and trotted up the hill. One honored the bison by peeing on the trail and then flicking dirt towards the bison herd before cresting the hill, where all three wolves howled and yipped. We listened with glee. And only after the wolves had gone quiet and out of sight did we continue our way through the winding park, now scattered with deer, the car pointed towards the steep snow capped peaks and our eyes turned to the sky as the vibrant rainbow had just doubled. We couldn’t tell if the park was telling us we should stay or wishing us luck on our future travels so we kept course. After exiting the park, we eyed a huge skittish blonde fox whose bushy tail was as long as it’s body. This seemed to confirm our route. Feeling like we had just witnessed the best from-car wilderness experience possible (Andreas’ mentioned our on-foot engagement day, surrounded by hummingbirds, a sunlit chasm, a black bear siting, and rhododendron laced forest no longer felt up to snuff), we were still in awe of the surrounding mountains. And then, another rainbow. This one stemmed gloriously from end to end. We stopped for a photo and I proclaimed it might just be my best shot ever. A few miles later, the rainbow started to double and perfectly lit the mountain peak in front of us. I declared another photo op of which I am attaching the view. The landscape continued to impress as we gained and lost thousands of feet up, over, and across the Clarks Fork Valley on the Chief Joseph scenic byway as darkness descended upon us. We made it to Cody just in time for a late night meal. Well done Road Atlas, well done. William Henry Jackson and John Merle Coulter of the second Hayden survey discovered this waterfall of the Gibbon River, height 84 feet, in 1872. Elk herd hanging out by the side of the road. Andreas’ eyes force him to stop to take in the view. One of the best parts of the ride, the grass was so vibrant green and the trees provided the perfect shade during the climb back to the car. Another beautiful falls in the distance. The best view was riding through the open field towards the snow-capped mountains, it definitely felt like bear country. Underneath, a partially molten magma chamber, remnant of a volcanic explosion 600,000 years ago, supplies the heat. The source of the water flowing out of Yellowstone’s geothermal features is rain and snow. Falling high on the slopes in and around Yellowstone. This cold ground water is warmed by heat radiating from the magma chamber before rising back to the surface. There were three redwoods standing here before thoughtless souvenir-hunters chipped away the other two. A 1907 photograph shows a second trunk in the background (before this trunk was fenced).